When I still had post-baby weight to lose, every Monday night I would watch The Biggest Loser. I found show motivational and relatable. One episode, there was healthy turkey chili recipe made and that recipe became a staple in our house, for over 5 years now. This ground turkey chili is healthier than its traditional counterparts because it’s made with leaner turkey instead of beef, chock full of vegetables and uses simple preservative-free spices like organic taco seasoning and chili powder (=> 3 must have homemade spice recipes). Oh, and chili in adobo sauce is wonderful flavour boost (depending on a brand there might be one preservative in that but…I mean, come on). 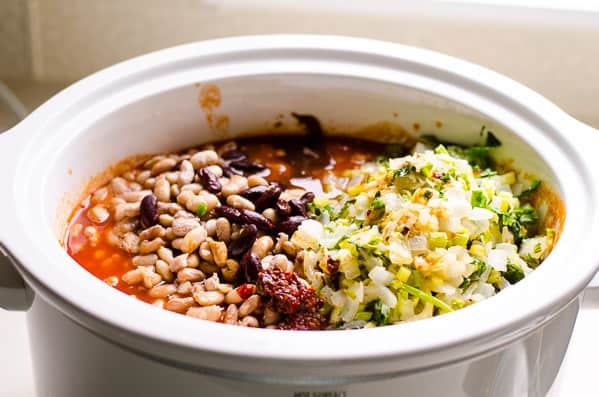 I cook my own beans, which I highly-highly recommend to do if you are into buying organic BPA free canned beans. I included both cooking methods, stovetop and slow cooker, to suit your circumstances. And if you are a chili lover like me, then you might also like crockpot buffalo chicken chili and crockpot chicken chili => both are slow cooker recipes and mild enough for kids. 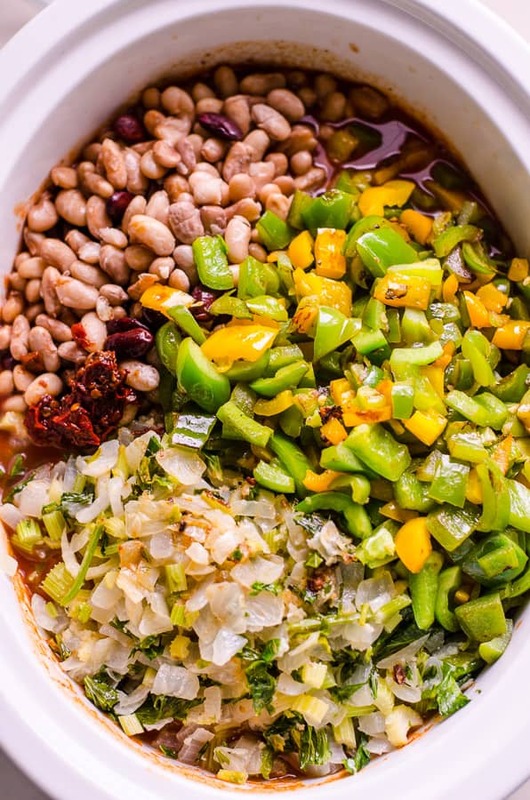 How to cook dried beans – I have had a bag of organic dried beans sitting in my pantry for weeks now. 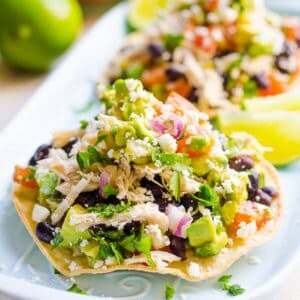 The day I cook them for freezing, I also make a dish using freshly cooked beans, usually it’s either bean mushroom soup (all that bean broth is calling for soup), mango black bean salad or garlic hummus recipe. Money savings are incredible, comparable to making kombucha from scratch savings. Clearly, if I do not sound convincing enough, feel free to use canned beans, just remember to start with less salt than me because my beans are unsalted. 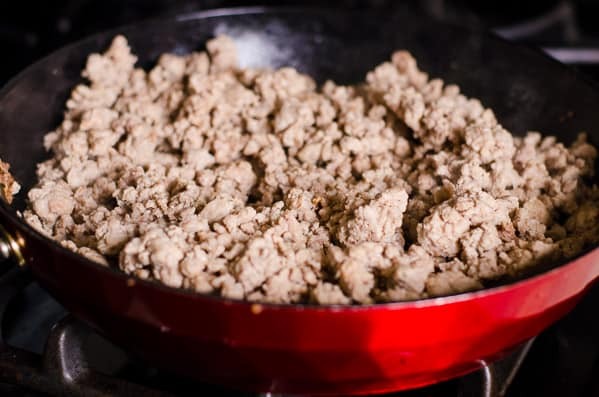 Brown ground turkey, easy-peasy. If you incur any juices, just drain them into slow cooker or a bowl (for stovetop method). Turkey doesn’t have to be golden brown but would be nice for extra flavour. Level of brown-ness depends on a type of skillet you are using. Mine has high edges, so food comes out more steamed/cooked than fried. Sauté vegetables. I did a mistake and cooked onion, garlic and celery together, which again made vegetables more steamed than fried. Cook onion and garlic first for maximum flavour, then add watery celery and peppers. Put kids to work. They love mixing, stirring and cracking pepper, and this healthy turkey chili slow cooker or stovetop is perfect for learning kitchen basics. 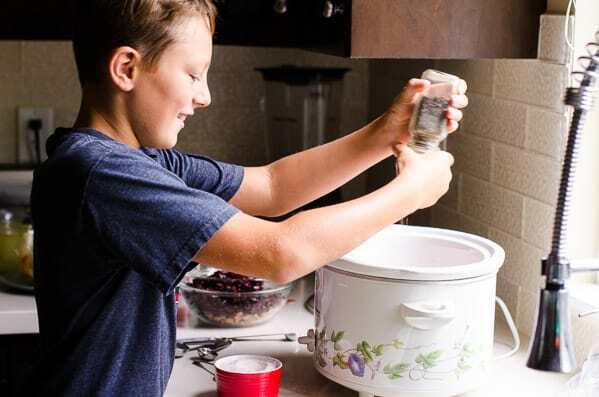 My boys love to help only because they see me cooking and are curious about what I’m doing, and I try hard to over come my resistance about mess and things not done “right”. Let them cook, but first cook yourself. 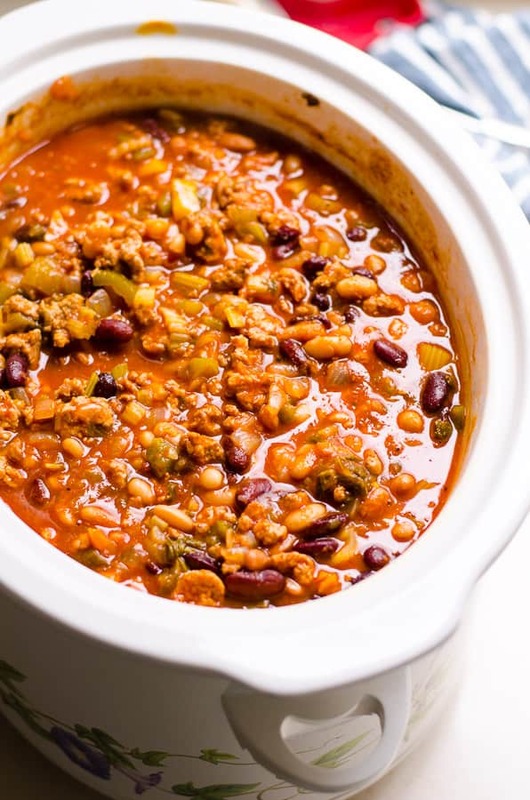 Crockpot turkey chili comes in handy when you want to start chili in the morning for dinner, while you are busy doing other things. 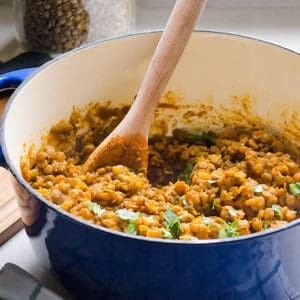 Stovetop is great for a last minute dinner idea – I highly recommend to use quality dutch oven or heavy bottom pot (second choice) for even cooking. Enjoy this Biggest Loser turkey chili! 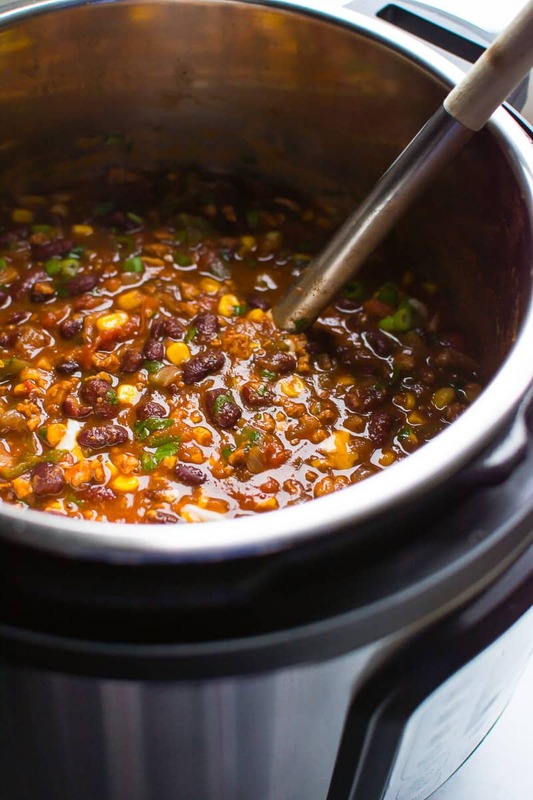 If you own an electric pressure cooker, you could make my Instant Pot chili in it. 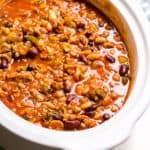 This is THE BEST Easy Healthy Turkey Chili Recipe I got from The Biggest Loser years ago that I cook year round on the stove or in slow cooker (crockpot). Healthy Turkey Chili in Slow Cooker: Preheat large ceramic non-stick skillet on high heat and add ground turkey. Cook until brown or about 7 minutes, stirring and breaking into small pieces with spatula. Transfer to a large slow cooker. Return skillet to medium heat and swirl a bit of oil to coat. Add garlic and onion, sauté until translucent or 5 minutes, stirring occasionally. 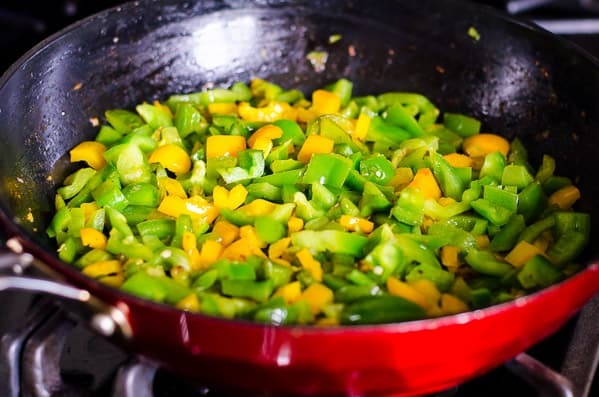 Add celery and bell peppers, sauté for 5 more minutes, stirring occasionally. Transfer to slow cooker along with beans, tomato sauce, broth, chipotle pepper, chili powder, taco seasoning, salt and pepper, and stir. Cook on Low for 8 hours or on High for 4 hours. Serve warm. Healthy Turkey Chili on the Stove: I recommend using large dutch oven or heavy bottom pot. Follow the same steps as for slow cooker, only once turkey is browned, transfer to a bowl. Then sauté vegetables and add pre-cooked ground turkey back in the dutch oven along with remaining ingredients. Cover, bring to a boil, and simmer on low heat for about 1 hour. 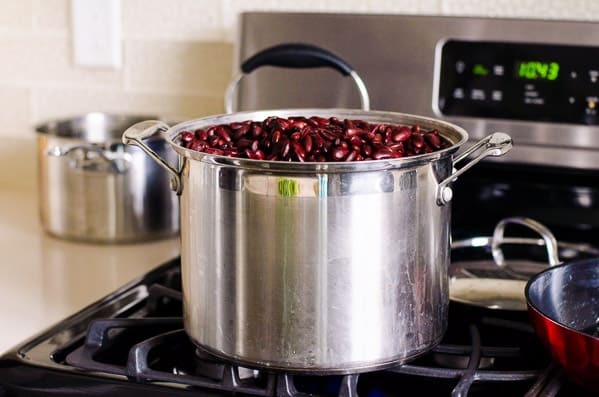 *Learn how to cook dried beans and freeze for later – saves a lot of money vs. buying BPA canned organic beans. 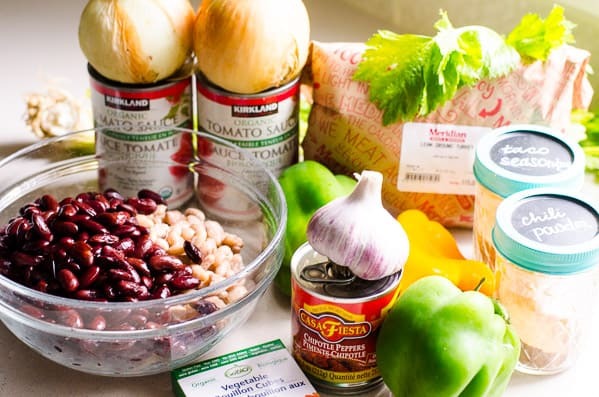 **You might need to add more salt if tomatoes and beans you are using are not low sodium or salt free (for example, my cooked beans are unsalted). Thank goodness we have air-conditioning because I made this into a five-alarm chili on an 83 degree day and it is delicious!! I made a few modifications, but this is definitely going into my recipe notebook! My main modification was to omit the chicken broth ONLY because I didn’t have room in my crock pot for it. I have a tendency to double or triple recipes so our freezer is always stocked and this happened today (after dinner tonight I was able to freeze 4 lunch-size containers for my husband plus 2 large dinner-sized containers for later). I used 3 pounds of turkey and way more beans and crushed tomatoes than this recipe called for. I also added a lot of heat since my husband loves heat. I added a jalapeno (seeds and all) and way more chipotle in adobo sauce plus I used my husband’s homegrown hot chili powder (which is much hotter than store bought). The flavors from this chili remind me of my Granny’s bean soup recipe and that brings back happy memories and nostalgic feelings for me. We will be enjoying this chili all fall and winter thanks to this yummy recipe! Sounds like you do like heat. :) I would love it but my kids wouldn’t haha. What size pot do you use or a few at time? Glad you had fun. I’m making my Instant Pot chili outside for now since we don’t have AC. Haha. That’s huge. I bought huge stockpot at Costco and returned it because I ended up buying 8 quart Instant Pot. How many people in your family? Oddly enough my immediate family is only me, my husband and our 18 year old daughter who leaves for college in September and hardly ever eats what I cook, so I guess I cook for a village but usually only feed two people (over many, many days of enjoying leftovers). I think I get it from both of my grandmas – they always cooked for a crowd. Plus, I love being able to send my husband with home cooked food to work every day. 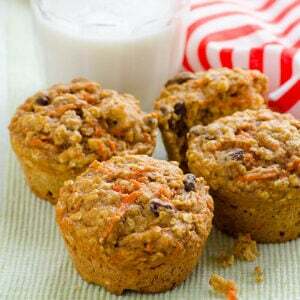 You can always freeze, sure way to avoid pre-packaged freezer junk. Good for you. I should start doing the same because my 3 men will eat me alive soon. It’s harder for me because I test many recipes and cook for the website, so that size of a pot would be awkward. But re-makes once a week I should like triple the recipe! I hope you are holding up with your daughter leaving for college. I’m dreading that time but maybe by then I will be ready for new stage in my life – freedom and time with Alex one on one. We are never alone, NEVER! I know it’s supposed to be spring, but a sudden chill and rainy weather has me hungry for chili. This chili is cooking away in my crockpot right now, and it smell delicious in here! I didn’t have quite enough bell pepper, so I added grated carrot. 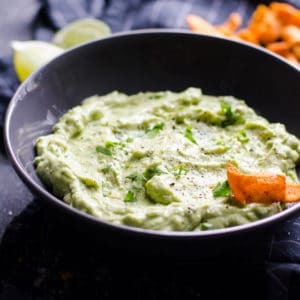 Just another way to get the family to eat veggies, and I so appreciate this website! It’s so not spring on the West coast. So cold and rainy. Unusual. That’s very good sub. Enjoy yummy food all weekend cozying up! I should make Chili too. If 1 serving is 1.5 cups and there’s 8 servings, I definitely have WAY more than 12 cups. Anyone else run into this? Can you freeze this ahead of time if you cook the meat first?? Trying to have freezer meals on hand ahead of time! 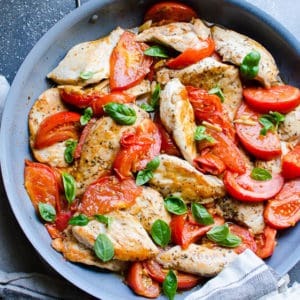 I have cooked this recipe and loved it! 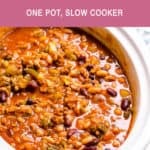 As a very busy on the go mom, I’m a huge fan of anything that can be made in a crockpot. This was so delicious. The only thing I added was black beans (love black beans). I topped it off with some chopped green oinions, a dollop of Nonfat Plain Greek yogurt, and a few slices of avacado. The rest of my family had some grated cheese on top of theirs, but I am trying to be good. I will definitely be keeping this recipe and making many more times in the future. Thanks so much for sharing. 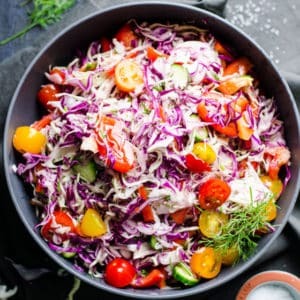 how many servings of vegetables are in 1 serving? Made this, with minimal alterations, I forgot the broth, doubled up on both beans, and used 3 different colored bell peppers – though I don’t think the last technically counts as an alteration. I too love left overs and had planned on using them for Chili baked potatoes later in the week. I let it cook all day while I was at work, Stopped by my home for 5 mins to declare dinner ready and left for about an hour on a walk. I was lucky to get a bowl, my family LOVED this dish! They want it again and soon. Still looking forward to Chili topped baked potatoes so they will probably get their wish soon! Thank you so much, I love having a healthy delicious meal to feed my family of 8 without having to spend all night in the kitchen! As soon as I am able I am going to invest in getting your cookbook! Looking forward to more delicious recipes! Thank you! Hi, Ruth. You are very welcome. It is not my recipe but I will take credit for delivering it to you LOL. Your life sounds very familiar to me. To feed 8, wow! I can barely feed 4 of us, constantly cooking. I Love taking walks too and big pot meals with leftovers which seem to disappear fast. Chili loaded baked potatoes sounds AMAZING. I should make them too! Take care. This sounds amazing! Can’t wait to make it tomorrow! My daughter is allergic to bell peppers 🙁 do you have any recommendations for a replacement? Thanks! How about mushrooms?! Flavourful as well. I would do that if I didn’t have kids lol. Sounds amazing!!! WOW! I know it’s hard to cook when you are dealing with different tastes and diets. Sometimes I wanna shoot myself too! Glad everyone liked it. Also made this one! Just yesterday. Had leftovers today for lunch and it was even better! Really really yummy! Thanks for the recipe! Made this last night and LOVED it! This is definitely being saved for future meals. THIS is my favorite chili ever!!! Fantastic. If you want to spice it up, put some drops of Frank Hot in your serving !!! 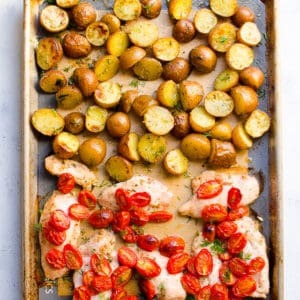 I am cooking this now, waiting on the veggies to cook and then it’ll all go in the crock pot, I’m excited about this but hope it’s ready before I leave for work. Wondering if it completely messes up the entire chili if you don’t do the pre-cooking? 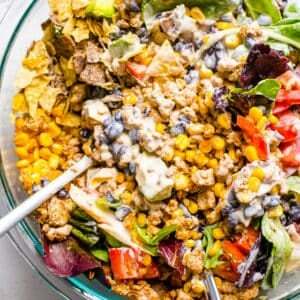 Would you be able to throw the veggies and (raw, thawed) ground turkey into the crock pot? 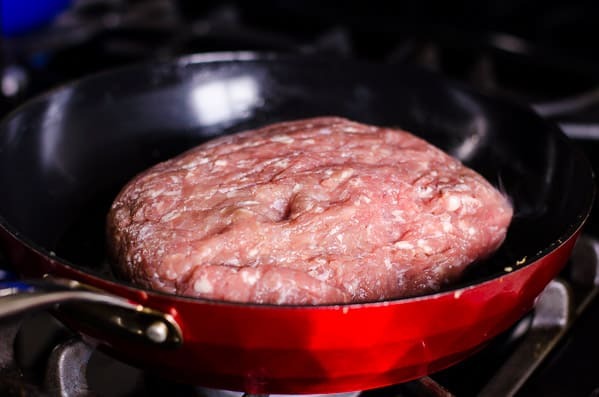 If not what about if I cooked the ground turkey the night before, refrigerated it, and threw that in the next morning? Don’t! I did it once and it was disgusting! My meal was like a baby food, yuk. It was disgusting! :) Pre-cooking the night before – yes, absolutely. Made this today, and the verdict from my picky 14 year old is that this is delicious. :). I haven’t tested it myself yet (it’s not quite dinner time yet) but it smells fantastic! I did notice that it’s very soupy, though, and I followed the recipe very carefully. Wondering if I should add less chicken broth next time… Thanks for the recipe! Sure, if you would like to. Mine wasn’t soupy. I wonder if a lot of condensation went into the crock pot off the lid once you took it off?! But still shouldn’t be that much. Feel free to adjust the liquid. I’m flattered my recipe impressed the teenager. :) Enjoy! You could also add some crushed healthy tortilla chips or masa flour to thicken it a bit. 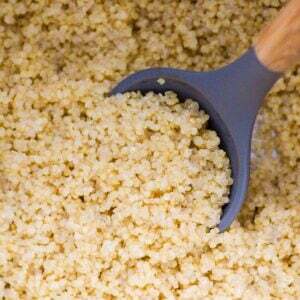 Cornmeal would work too. Glad all girls loved it!!! I use whatever kind I have on hand and is cheaper at that time. For this chili I used red, yellow and orange. Either I was really hungry or this turkey chili was amazing! It was probably both. I was never a big fan of chili but this was so good! Would def be making this again and again! Haha. I think both. This chili is my favourite so far. Glad I changed your outlook on the chili world. 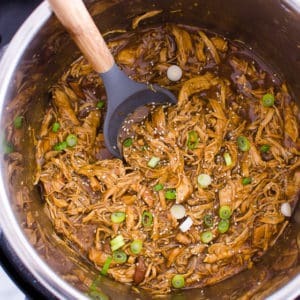 I just assembled this in the crockpot, an I can’t wait to have it all week! Awesome! 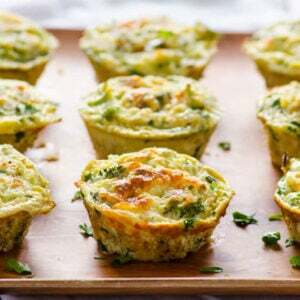 You can also freeze the leftovers. I know my recipes make many servings but I like leftovers and I have 3 men to feed. Enjoy! 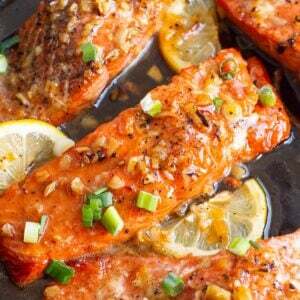 I just cooked this for dinner tonight — delicious!! I had to make a few little modifications because I own the world’s smallest crockpot (literally) and couldn’t fit everything inside, so I made it in a pot on the stove and simmered it for an hour instead. My guy is really picky and doesn’t like cooked celery, so I added extra bell peppers. But he said it deserved a place in our dinner rotation! 🙂 I can’t wait to try your Buffalo Chicken Chili too!